Mostly Positive (126) - 77% of the 126 user reviews in the last 30 days are positive. Very Positive (14,744) - 86% of the 14,744 user reviews for this game are positive. 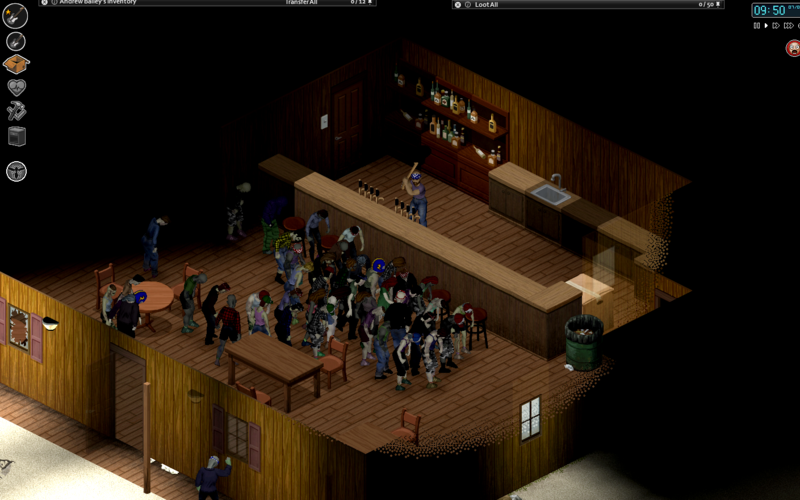 “Project Zomboid is a much more ambitious game than we could ever have hoped to fund ourselves. It has grown massively over the years, and it’s been a rollercoaster, but we now find ourselves in a stable financial situation with an overall positive reaction from the Steam community. We hope you will join us, but if not we understand. If you're not ready to jump in yet, then please consider us when we break out of Early Access. How often do we update the community? We have weekly newsletters known as 'Thursdoids’ which we publish on our site and on Steam every Thursday. These detail what we've been up to during the week, often with sneak peeks of upcoming features, interviews and videos. If a blog is fairly dry they’ll sometimes only be posted on our website, but we've had this unbroken chain of ‘doids for a long time and (although when milestones have been reached we may switch to doing them every two weeks) we certainly intend to continue them for the foreseeable future. We have a reputation that seems to diverge greatly when it comes to update frequency depending on who you ask. Many consider our game frequently updated, some consider us slow. Some public builds have arrived after three months, others with bigger features have taken more than six. You can see all our public build content, and the dates of release, here. After a build is released and patched we reopen our public unstable beta, known as the IWBUMS (I Will Back Up My Save) branch – so the community can test it, and help out by reporting bugs. During these times, the greater proportion of the development calendar, we try to update the IWBUMS beta every Thursday. Some features, particularly NPCs and the new animation system required for their implementation, have taken a very long time to implement. This is largely out of our commitment to getting the features right and them not disappointing on release, but it should be noted that we make no apology for delaying their release until we feel they would be enjoyed, live up to people’s expectations, and most importantly do not have a detrimental effect on the gameplay or stability of the game. We now work in partnership with several other companies to facilitate all this (General Arcade, and The Eccentric Ape for example) and have also greatly expanded our own staff in the past year. We will admit to a few long waits between updates in the past, and far longer waits for big features, but we feel from community feedback that the majority of our customers are satisfied with the development of the game. It should be pointed out too that the game has significant modding support, with map editors and full unrestricted lua modding access, and as such have a vibrant modding community for players to check out. It should also be taken into consideration that the game is already very far through development, we’d estimate that we’re 75% complete at this point, and we also now have many 1000+ hour players. There is a lot of content to enjoy in the game already and we firmly and proudly believe it worth its current price as it stands. Please consider reading some reviews if you are still unsure about the content of the game, the release frequency or the debate over the features that have been implemented and those still to come. Again, full details of all updates to PZ since the release on Steam can be found here. What is required for 1.0? Now vehicles have been released to PZ players there are two major features that are yet to be implemented, the first of which is a requirement for what we want to achieve with the second. New animation system – a new animation and model system that will allow for more varied and engaging interactions within the Knox Event Exclusion Zone. Allowing better character clothing, more variation in zombies and far greater modding power for the community. This system is now being developed alongside our friends at The Eccentric Ape, and will also allow for new animations for stealth mechanics (looking round corners, crouching behind walls, cover etc) as well as a rewrite of the combat system to leverage new animations to make combat more involved, intuitive and fluid. NPCS - A far reaching and in-depth NPC system with character relationships, personalities, and an emergent story engine that allows for diverse and emergent character based zombie survival story unique to every playthrough. This will also include the return of Kate and Baldspot who starred in the early alphas of the game. Several features also require either significant modifications, rewrites or completion before we could consider 1.0. Map completion - We still have a major city (our fictionalised version of Louisville, built to a more PZ scale) and an Army base. The rest of the map, which is already pretty vast, can be found here. UI Rewrite - The UI isn’t perfect by any stretch. We would like to get a more intuitive and ergonomic UI system implemented. We avoid ETAs because Early Access development in particular is often filled with unknowns. We want to ensure we get these highly anticipated features right. In the meantime however we will continue to update the game and provide new features for our community to play with. While certain developers work alongside our friends at T.E.A. and General Arcade on the ‘bigger’ features we have others devoted to the day-to-day maintenance of the current game: balancing, new crafting recipes, vehicle gameplay, weather systems, professions etc. 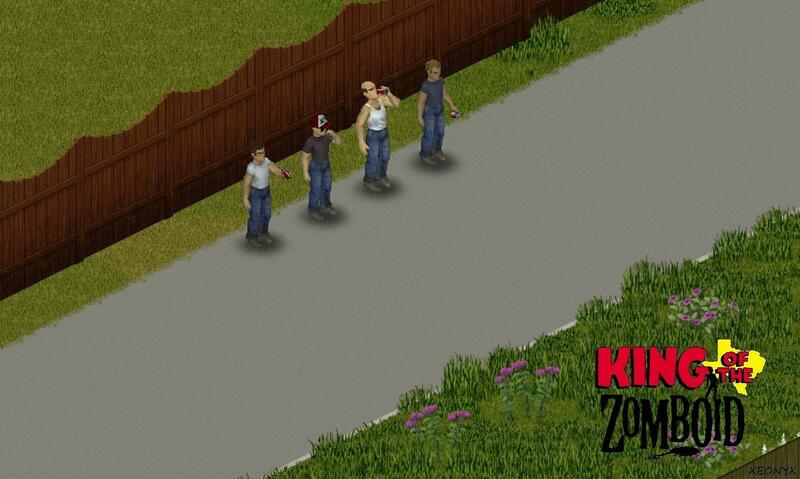 At this point, once we feel we have fulfilled every promise we gave when the Project Zomboid site first launched (except the last one, ahem, ignore that. Absolutely no one wanted that, it turned out), as well as the extra things detailed above, and the game is sufficiently polished and bug free, we will launch the game as 1.0 and leave Early Access. Get one copy for yourself and give the other three to friends! Hey all, here’s the highlights of the last four weeks of Project Zomboid development – compiled from the Thursday blogs that appear at http://www.projectzomboid.com/blog/ and on the PZ Steam boards. Next up, meanwhile, we’ve had some significant improvements and fixes made by Bitbaboon Mark to the core animation blending system in past weeks. He’s fixing a whole bunch of issues, snaps and glitches that have been vexxing us for a long time – digging deep into the code, and doing a total rewire where necessary. In prior Thursday vids we cut around these uglinesses as much as possible, but they still reared their heads. Snaps between character animations, jarring moves when turning to certain compass directions while strafing, and various other ugly things that we just couldn’t account for were plaguing us – but have now finally been fixed, leading to a far smoother animation blending system. Zac’s prepared a video demoing the new blending – although please note he’s running in debug, so this doesn’t represent gameplay. Speaking of, please note, that we’ve decided to put the completion of the high-res model rendering work described in the last Spiffo update on ice for little longer, since there were still numerous issues with it that meant it wasn’t suitable to put into the main line – and also it kept getting further broken by the flurry of additions and changes from the team’s work described above. We feel it would be best approached toward the end of Build 41 dev just before IWBUMS, at the point we could get extra resources on board to get it working right. As such all videos until then will use the traditional character resolution. Zac’s work on masking out different parts of clothing items has resulted in several extremely useful features. First, it now allows us to wear pieces of geometry clothing on top of other geometry clothing – as opposed to being a texture drawn over the character’s skin. This used to be impossible: the clothing worn underneath would always poke through the geometry of the clothing on top, especially when moving. So now we can layer clothing appropriately, and also spray blood on individual layers and garments – instead of your survivor’s body as a whole. Our old solution was to to draw underclothing as textures directly on the character model, which unfortunately led to the side effect of them looking like body paint and lacking the bulk of real clothing. Now we can easily turn off areas of the clothing that are covered, so we are provided with many more options. This also allows us much more visual indications of damage and clothing wear and tear (quite literally). As well as putting a player’s newly scavenged/treasured Spiffo shirt at risk of damage, this will allow much more variety with zombies in particular. 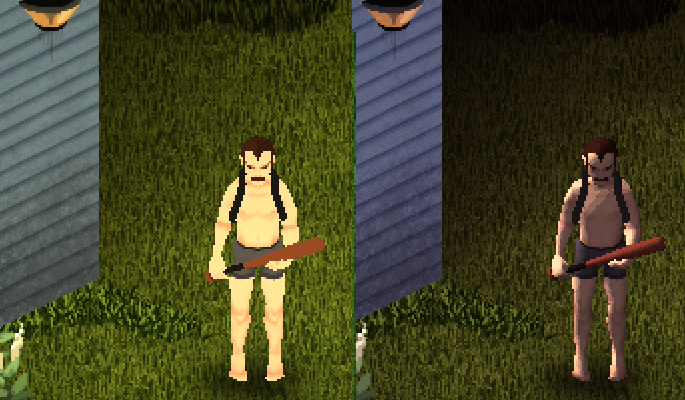 RJ has been adding code to implement this new system to further randomize zombie’s clothing conditions, and tie potential clothing damage into the various game systems for the player. Our primary rule with Build 41 is that we’re updating animations to complement and add foundation to our existing gameplay, rather than get too excited and add in loads of new systems that could otherwise wait till a later version. A good example of this is something that’s been in the game for a while, but have always been hidden slightly: our annotated survivor maps that show you the way to various hidden stashes. 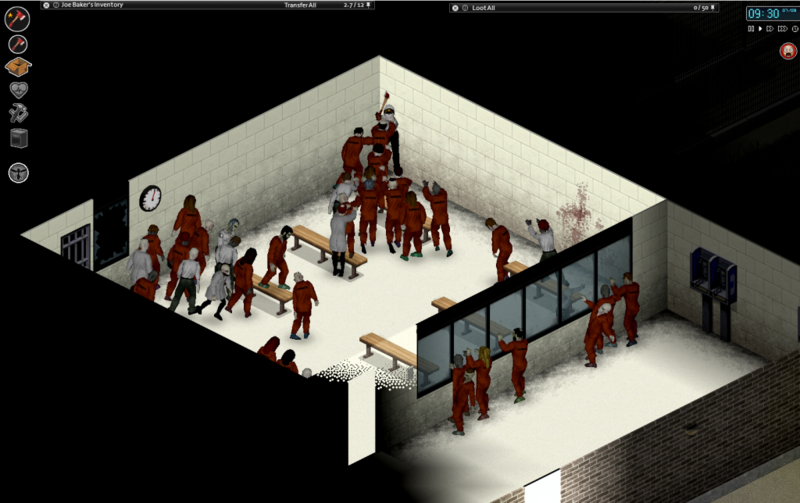 Now though, to create a bit of a breadcrumb trail for players to follow, we have introduced ‘uniformed’ survivor zeds. They are the walking corpse of a survivor like yourself, who will not only carry some handy loot, but also potentially lead you to a place of interest. Over with General Arcade Yuri has been continuing his visual effect work – and has fine-tuned his water so that waves and ripples aren’t as small. When it was windy in-game this was fairly uncomfortable on the eyes of our internal testers, so they now look like this. Here’s a quick run-down of other items of interest that have gone into the internal branch of Build 41 over the past month. Extended idle animations. Depending on your character moodles, pain or other variable, you’ll sometimes see you character scratching an arm, shivering, checking his weapon, wipe his legs to check for blood etc. New timed action animations, alongside fixes for the current timed actions: digging graves with a shovel, looting on the ground or in shelves, cleaning blood etc. New outfits are also being added along with their own zone - Gigamart employee for example, and branded logo-ed shirts for various locations. New animation variants for the player defending against zombie bites. Three new variations of zombies thumping on objects. We’ve gotten ChrisW’s Sims-style wall cutaway system into the main line, but there are still a few issues to work out before its 100% operational. Support for characters to lower and raise hoods on hooded clothing, for example hoodies and certain coats, have been added alongside several new idle animations used when the character has injuries. Zach continues his great work adding more tools and features, this time to allow Martin and the other devs to quickly add and test new costume pieces through the AnimZed editor and preview them in game. We have added many clothing items such as a poncho, hoodies, scarfs, aprons and swimming outfits. RJ also now has hair and beard styles being associated with zone costumes (for e.g. so you don’t tend to get military zombies or cops with hippy hairstyles and big beards). Oh, and just today we found a way to make PZ feel a little more American. This is the third monthly Steam round-up of development news for Project Zomboid, but weekly Thursdoid blogs are posted both on our website and on the Steam discussion boards. A general list of stuff added to PZ, and vids of features being worked on, is kept here – so you don’t have to plough through endless dev blogs for info. The Block of Italicised Text would like to direct your attention to the PZ Wiki should you feel like editing or amending something, and the PZ Mailing List that can send blogs like this and patch notes direct to your mailbox. We also live on Twitter right here! Our Discord is open for chat and hijinks too. Our thanks to our good friend Xeonyx for creating the header image using the internal anims build. That’s all for now, keep tabs on our website for more every week! First off, a general ‘recently implemented animations’ video to whet your appetite along with some new Zach Beever musical goodness that will be coming in build 41. A key aspect of PZ mapping is zoning – which we primarily use to mark up areas that are (for example) suitable for foraging and car spawns. Now however, with different clothing for zombies, we can flag which parts of the PZ map can spawn which particular zombie – or which group of particular zombies. This, then, is how we can spawn only guards and orange jumpsuit-wearing prisoners in Rosewood prison. Likewise, RJ has created a ‘wedding’ spawn zone over one of the churches on the map – which ensures that all zombies inside it, and outside for the selected area, have a very high chance of dressing in smart clothing, with a guaranteed bride, groom and church minister amongst them. This system will allow us to have many and varied different pockets of particular zeds – police in police stations, lumberjacks at McCoy logging, military in military areas etc. Likewise, we will be examining the best methods to make sure that zeds in bathrobes or not wearing clothes are only found in homes and home bathrooms in particular. (It should be noted that aspects of this will also involve a very slight rewrite of PZ lore in terms of the outbreak, but we had intended to return to the radio/TV broadcasts soon in any case). We’ve been waiting for some important/complex work on rotational anim movements from TEA for a fair amount of the past few weeks – but there’s still been plenty of other areas for us to work in this time. A few examples of this includes knife attack animations, and tying survivors and zeds getting bloodied by attacks in general in-game. This has also involved us adding some additional combat skills, and in the process removing the skill point system. From Build 41 onwards skills will automatically level up when you gain the XP requirements, as we felt the manual skill point system never worked particularly well and would do so even less with many more skills. RJ also adds a note on how running through crowds of zeds will now be a little more fraught with danger. Next up, the issue of character and zed model visual fidelity. An area that was proving strange in terms of 41 development was that somewhere along the way some of the visual fidelity of characters had been lost – and simultaneously, somehow, models looked far more buff/hunky than intended. Feet, also, seemed a little on the large side. After a bit of a dig, we finally located a bug in the exported model data that explained it. 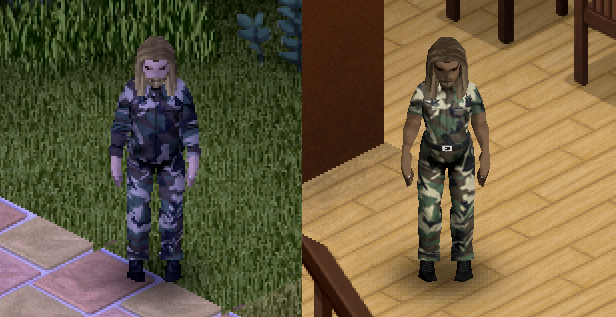 Due to this bug, the lighting of the characters was broken, which resulted in very washed out characters with little lighting shading – which in turn removed definition that made muscles look bulkier. This has now been fixed and, after re-exporting all the clothing, has allowed us to achieve much better character model rendering and lighting than we’ve shown off previously during this recent leg of anim development. As ever, please keep in mind that we’ll continue to balance/tweak to make sure characters fit their surrounds as well as possible – as well as adjust the models themselves seeing as you can now see individual facial features much more clearly. These caveats notwithstanding, however, we’re pretty happy how they’re looking. During this process we also focused on another prominent issue: that the character pixel resolution when zoomed in was extremely blocky and lacking in detail. Due to the ways that our initial zoom system handled things, characters were too harshly pixellated. This caused them to be extremely jaggied compared to what it was in the old days, when we were rendering characters to an off-screen sprite before placing them into the world. So over the past few weeks we’ve been doing some significant work on changing how the game handles the zoom, which in addition to fixing this issue should ultimately lead to slightly more optimized rendering of the game – as well as providing the character models much more detail to play with. The branch with this system on it isn’t complete – navigating indoors presents issues, mouse input hit-testing isn’t fixed up yet, and we’re having issues with seams between tiles when zoomed out – so it’s not quite ready for integration into the main test build. Here’s a quick video of us running aimlessly around zombies under lights to show it off though. Zac has been doing a whole bunch of optimization work, with fun example vids of his wares seen here with his zombie spawning, and here with multi-threaded rendering. RJ has implemented his previous work on looting improvements – giving us more control over general clutter, and more realistically placed items in houses. 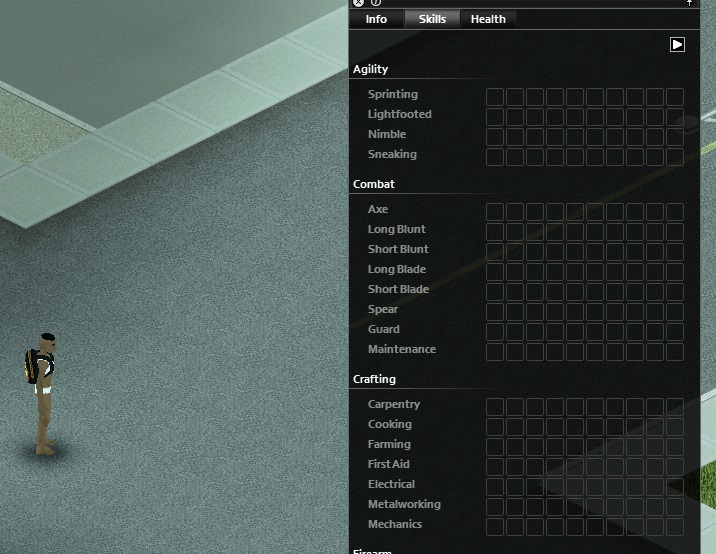 Mash has begun creating icons for new clothing and weapons, Will had begun setting naming conventions for them. Connall and Turbo have continued to implement new timed actions. Yuri has finished adapting his water/puddles into Zac’s revamped shader system, and is now experimenting with a particle system that will provide the bedrock for his fire improvements. The other Zac meanwhile, Young Zach, continues to deliver the new South-tinged PZ score that can be heard at playing over the initial video in this blog. Xeonyx is chasing/fixing map bugs in his now complete Kingsmouth Island challenge map. This is the second monthly Steam round-up of development news for Project Zomboid, but weekly Thursdoid blogs are posted both on our website and on the Steam discussion boards. A general list of stuff added to PZ, and vids of features being worked on, is kept here– so you don’t have to plough through endless dev blogs for info.The Block of Italicised Text would like to direct your attention to the PZ Wiki should you feel like editing or amending something, and the PZ Mailing List that can send blogs like this and patch notes direct to your mailbox. We also live on Twitter right here! Our Discord is open for chat and hijinks too. A huge thanks to the wonderful MathasGames and Dean Cutty for making the awesome intro video. If you love indie games their channels are well worth a sub.